I decided to not go for the 255 front wheel option due to the £1095.00 price increase including the extras tax in the first year. 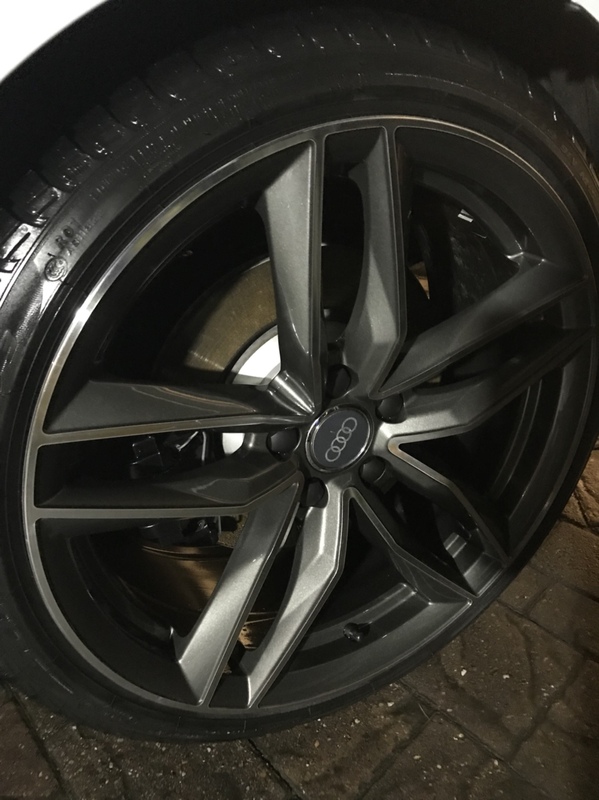 I am now looking for a decent set of aftermarket alloys and wondered what the ETs are for the standard Audi saloon rims? Also do anyone know if there are issues getting alloys because 3 sites I have looked on state they had no sizes fir for the 2017+ model? I like the OZ Racing Laggera HLT alloys in gloss black but they don't fit? Strange that the 2016 can use them. I think the centre hole on OZ Laggera HLT is bigger than original 57,1. Maybe that why it doesnt fit? if you buy a hub centric ring it will fit. They normally have adaptor rings to alter the spigot size to suit. I found a set of OZ Laggera HLTs in gloss black which I think would go nicely with the silver and gloss black trim pack. They are not cheap at £1700 a set and not entirely sure if they would fit yet. The fronts are ET 47 instead of the standard ET 46 and the rears are ET45 instead of ET42. It doesn't sound that far out to me but I would hate to get them and they rub. 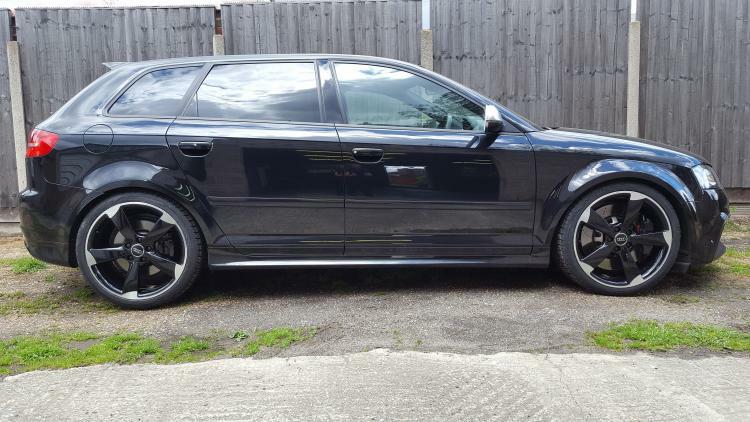 Whilst I am not getting my RS until May I am looking at wheels. They have a set 19 8.5J with ET 38. They will fit RS3. Edited by seventeenapg, 28 December 2017 - 11:20 PM. My concern is the 2017 saloon has different ET to the Sportback and ET 38 seems a fair bit different to the ET 46 states for the front wheels. 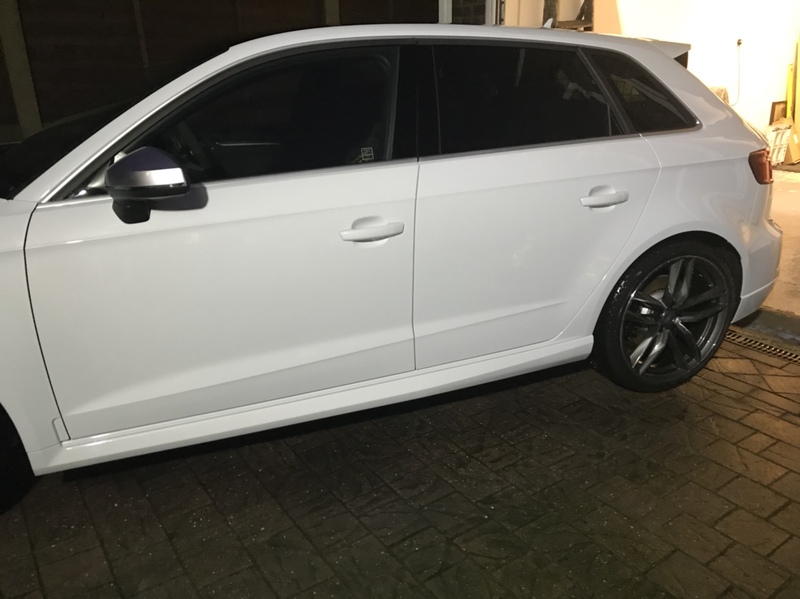 I have no idea why the Saloon would be different but when I phoned a wheel supplier they had all RS3s shown as the same size, but Audi stated they are not when I phoned them. I will do some comparison on the will they fit later as a starting point. The ETs of 42 and 46 are quite high compared to most wheels being shown up as around 25 to 40, so it would be good if someone knows why the Saloon is different. Just checked and on the front they will be 1mm closer to the strut and and the rear 3mm closer. I am guessing the front would be fine and if the back isn’t I could use a spacer to bring it out again. If you went for ET 38 it brings them 4mm further out from the strict at the rear and 8mm at the front. I’m guessing 8mm at the front is close to hitting the wheel arch and these figures are only based on 235 tyres. Interestingly the standard 235/35 to 255/30 like the wheel option shows an increase both onwards and outwards of 6.3mm. So in summary the larger ET takes the wheel closer to the struts but if too far should be adjusted ok with a spacer. ET 38 May fit but it depends how much clearance there is inside the arch as it narrows towards the top. Has anyone added spacers on the new Saloon and if so was than on standard or uprated options? As I’m not a great fan of the new 5 spokes, especially in basic silver I’m thinking of collecting the car, getting the wheels changed to black gloss and seeing how they look. With the silver car with black gloss trim I think that gloss black wheels would look better. Here is my understanding, your car (and mine) will have the bog std wheel which is 19" 8.0J 235/35 rubber and ET 42 back and front. Car can be supplied with 19" 8.5J 255/30 rubber and ET 46. But as well as costing more the road fund licence is also considerably more expensive and, as I don't like the wheels anyway, I decided on std rims which will be changed. 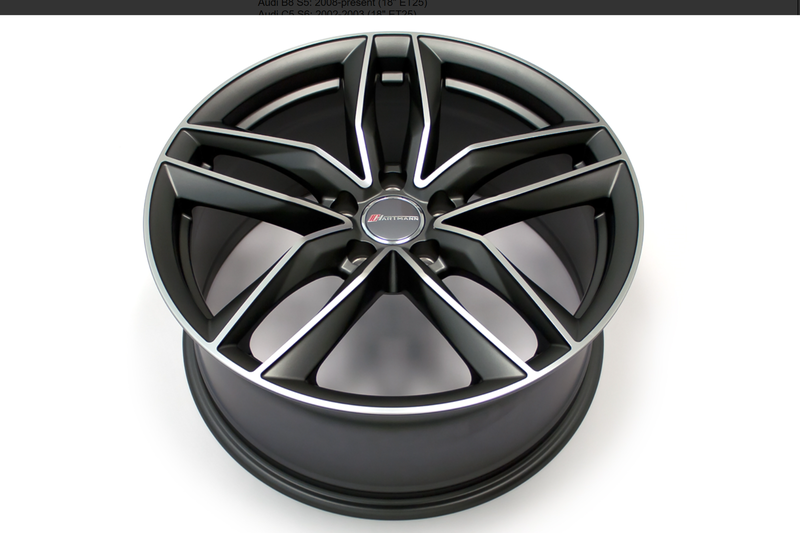 Looking at the Hartmann pictures of an RS 3 the rims I mentioned do look well. And, on reaching out to them, they say they are a perfect fit in every way. Edited by RS3Dell, 29 December 2017 - 05:52 PM. I would recommend that you choose lower ET than higher ET. There is plenty of space inside the wheel archer. If you choose ET 46-47, there is a risk that it will hit the caliper. I've oem winter wheel from PFL, which has ET49 and it was too tight on the FL RS3. Now I have 10 mm spacers, which becomes ET39. plenty of space and still inside the wheel archer. This makes total sense now that in standard size they are ET42 and yes I can see how ET 38 will fit, which opens up lots more possibilities on wheels. That's good to hear Alex. I'm on the hunt for the Hartmann replicas of the RS 6. I happen to like the design and they come in 8.5J with ET 38. They should just sit out nicely then? Edited by seventeenapg, 29 December 2017 - 07:44 PM. Edited by T-800, 29 December 2017 - 08:38 PM. So I take it no one has an issue fitting 8.5 rims front and rear on a saloon with the wider track? If that’s ok has anyone tried 245/30 or 245/35 tyres yet?